For fans in the US and Canada. You can attend a screening of the film thanks to Demand.Film. UK, Ireland and Germany coming soon. 2. Fill out the screening request form and the friendly folk from DEMAND.film will get in touch to confirm a tentative date and time of your screening. 3. DEMAND.film will sort out the details and build you a customised screening page. It will show the minimum number of tickets to be sold by the deadline for the screening to go ahead. 4. It’s then up to you to promote your screening to your friends, community and anyone that may be interested. If enough seats sell by the deadline, your screening confirms and the tickets are sent out. If there are not enough tickets sold, the screening cancels and no one is charged. 5. Have a great time watching the film on the big screen. The DVD/digital release of ‘Midnight Oil: 1984’ is coming up on July 4. If you pre-order via JB HIFI, you’ll go into the draw to win a posted signed by Rob Hirst. More info here. Limited theatrical run in select cinemas from August 9. More info here. Screenings will take place at select cinemas in Canada on Tue 28 Aug. More info here. For continued updates on international rollout of the film, be sure to join the ‘Midnight Oil 1984 International Updated’ Facebook group here. 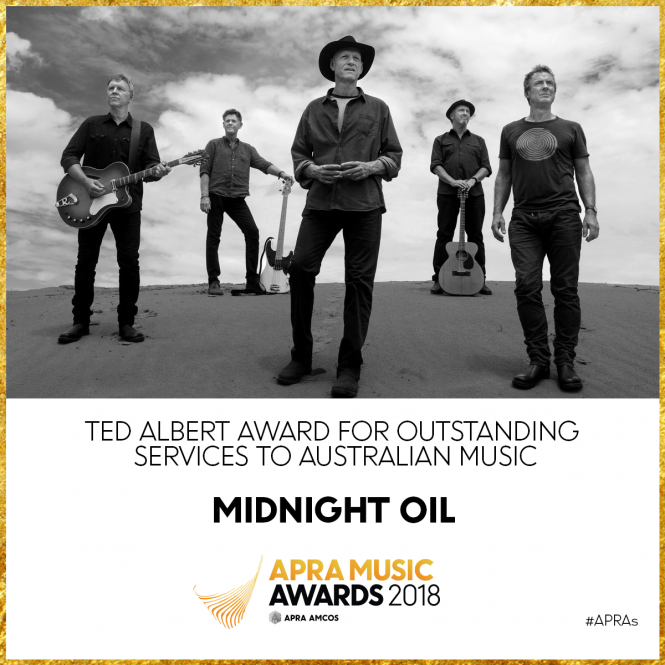 APRA AMCOS has announced that Midnight Oil will be the recipients of the 2018 Ted Albert Award for Outstanding Services to Australian Music at the 2018 APRA Music Awards. Spawned from the northern beaches of Sydney, Midnight Oil have always played by their own rules. Decades on, their rock n’ roll fury has remained intact – from when they first started making music together at school in 1972 to the final note played on their 2017 Great Circle World Tour. Always more than just a rock band Midnight Oil are environmental crusaders, social justice activists and powerful songwriters. In 2001, 100 music industry heavyweights polled by APRA placed Beds Are Burning at No #3 on the list of the Top 10 Best Australian songs of all time. The 2018 APRA Music Awards will be held on Tuesday 10 April.